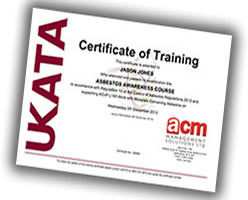 ACM Management Solutions Ltd is a member of the UK Asbestos Training Association (UKATA). UKATA is the UK’s leading association for asbestos training professionals and sets the standard in asbestos training. Our asbestos awareness training courses have been successfully verified & audited enabling ACM to offer UKATA certified courses. By choosing a UKATA member for your asbestos awareness training you are assured that the course will cover all of the necessary information and will meet the highest standards in content & delivery. ACM Management Solutions Ltd offer a number of flexible asbestos awareness training packages which fully comply with UKATA standards. Our pricing structure is extremely competitive and courses may be delivered at your premises or our Training Centre in Burton-on-Trent. ACM Management Solutions Ltd trainers have been providing asbestos training courses for over 20 years. Training is delivered in PowerPoint, via a laptop computer & digital projector either at your premises or ours. What building products might contain asbestos? Where might asbestos be located in buildings? What health risks are associated with asbestos? How to protect yourself and others? Delegates are required to sit a multiple-choice examination and will be issued with a Certificate of Achievement (subject to passing the examination). Please telephone us or use the contact form if you wish to know more and to arrange training.